Samsung Electronics reported a record quarterly profit of $7.3 billion, nearly double last year's figure on strong sales of high-end TVs and Galaxy smartphones. Most analysts, however, expect a run of four straight record quarters to end in December as the South Korean group, the world's leading maker of smartphones, TVs and memory chips, ramps up its marketing to counter Apple's new iPhone and other products in a crowded $200 billion global smartphone market. Samsung may have spent around $2.7 billion on marketing in July-September alone around the London Olympic Games and new Galaxy promotions, Credit Suisse has estimated. This year's expected record profit of 28 trillion won ($25 billion) will also trigger higher performance related payouts to many of Samsung's 206,000 staff early next year. And Samsung may have to set money aside this quarter if it fails in an appeal to overturn an Aug. 24 U.S. court verdict that awarded more than $1 billion in damages to Apple for patent infringements by Samsung. "Fourth-quarter profit will be pressured by one-off expenses: performance payouts and some $1 billion in legal provisioning relating to the Apple litigation. Excluding those, core earnings will remain solid and a swing factor is how much Samsung spends on marketing," said Lee Sun-tae, analyst at NH Investment & Securities. Analysts expect earnings to decline until the second quarter of next year as a slump in computer sales and a weak global economy sap demand for chips and electronics products. "The biggest risk for Samsung is competitive product line-ups from its rivals such as the iPhone 5. Because handsets drive most of its profits, one misstep in handsets could result in losses for the whole Samsung group," said Byun Han-joon, an analyst at KB Investment & Securities. Profit at Samsung's mobile division is likely to have more than doubled in July-September to around 5 trillion won - around two thirds of total group profit - as smartphone shipments topped 58 million, including up to 20 million Galaxy S IIIs. Ahead of full quarterly results due by Oct. 26, Samsung estimated its July-September operating profit jumped 91 percent to 8.1 trillion won from a year ago, beating an average forecast of 7.6 trillion won in a Reuters survey of 16 analysts. That would be more than a fifth higher than the previous record in April-June. The company, valued at around $197 billion, estimated its third-quarter revenue at 52 trillion won, in line with forecasts. 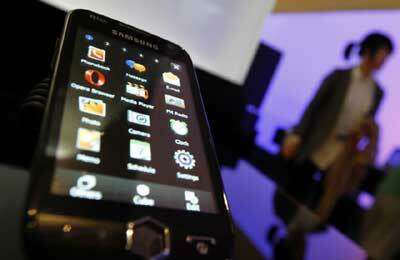 Samsung shares fell 0.5 percent to 1.36 million won ($1,200) on Friday. The stock has risen more than 7 percent since the U.S. patent defeat in August. Apple shares have gained less than 1 percent. Samsung's mobile division chief JK Shin last week predicted Note II sales could be three times higher than those of its predecessor model in the three months after launch - suggesting sales of around 10 million devices by the end of this year. Some analysts see the Note II, a stripped-out, cheaper version of the Galaxy S III and rising NAND flash memory chip prices helping Samsung deliver higher fourth-quarter profit. Nomura on Friday predicted October-December profit could be up to 10 percent more than the 8.1 trillion won in July-September. In a note on Friday, Citi analyst Henry Kim predicted strong October-December profits, driven by a recovery in semiconductors, though telecoms operating margins could decline by 5 percentage points to 15 percent as it spends more on marketing. "The semiconductor division will show the strongest momentum," he said.